Transport Wheelchairs are made for occasional use. They are typically used in hospitals for moving patients from one area to another. 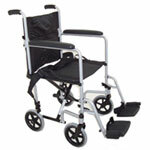 Similar in size and weight to a standard folding wheelchair with the exception of wheel size. They are lightweight and portable. Transport wheelchairs will often use castor wheels instead of the typical large back wheels and push rims you see on most wheelchairs. There are a few wheelchairs on the market that even have the ability to transform from transport to standard. See the Poly-Fly by Drive Medical. It has removable back wheels that allow the user to easily change the look and feel of your wheelchair.